For more than 100 years, groups in the western United States have fought over water. During the 1880s, sheep ranchers and cattle ranchers argued over drinking water for their livestock on the high plains. In 1913, the city of Los Angeles began to draw water away from small agricultural communities in the Owen Valley, leaving a dusty dry lake bed. In the late 1950s, construction of the Glen Canyon Dam catalyzed the American environmental movement. Today, farmers are fighting fishermen, environmentalists, and Native American tribes over the water in the Upper Klamath River Basin. A below-average winter snowpack and low rainfall throughout the year had caused an extreme drought in the area along the California/Oregon border. In April 2001, a U.S. District Court stopped water deliveries to farms in the Klamath Irrigation District to preserve adequate water levels in Upper Klamath Lake to protect two endangered species of Mullet fish (called suckers). Water was also reserved for the threatened Coho Salmon which need enough water to swim downstream from their spawning grounds to the ocean. In addition, several Native American tribes have rights to Klamath River water. Further complicating the situation are a handful of wildlife refuges which usually receive enough irrigation wastewater to support upwards of a million migratory birds and 900 Bald Eagles. In 2001, however, several of the refuges were potentially threatened with not having enough water for the birds which arrive each year in early fall. The severity of the drought was underscored by the town of Bonanza, Oregon. Famous for its natural springs, and entirely dependent on wells for drinking water, the town’s water supply was contaminated with pesticides, fertilizer, and manure. The water quality was so bad that it was not even safe to bathe in, much less drink. The problem stemmed from a very low water table. The drop in underground water levels was caused directly by the drought, and indirectly from the increased irrigation from underground aquifers to compensate for the lack of water from Upper Klamath Lake. As the water table dropped, clean water stopped flowing from the springs and wells, and dirty water from fields flowed into the water beneath Bonanza. Area farmers, many of them entirely dependent on irrigation, immediately launched protests when the court’s decision to stop irrigation flows was announced, leading to national media coverage. On July 24, the Department of the Interior approved the release of some irrigation water from Upper Klamath Lake, but the flow lasted only until August 23. The water was enough to save some fields growing winter feed for livestock, but some other crops were unsalvageable, and water didn’t reach every farmer who needed it. The Klamath Project dates back to 1903, when the Reclamation Service (now the Bureau of Reclamation, a branch of the U.S. Department of the Interior) investigated the possibility of converting rangeland, wetlands, and natural lakes into irrigated farmland. Construction began in 1906, the first water deliveries were made in 1907. The project was completed in 1924. The Bureau of Reclamation supplies water to the farmers at the cost of delivery, without charging for the water. Fodder, barley, oats, potatoes, and wheat are the principal crops on the 225,000 acres of irrigated land. In addition, the irrigation dams control floodwaters, and the Link River Dam supplies hydroelectric power. 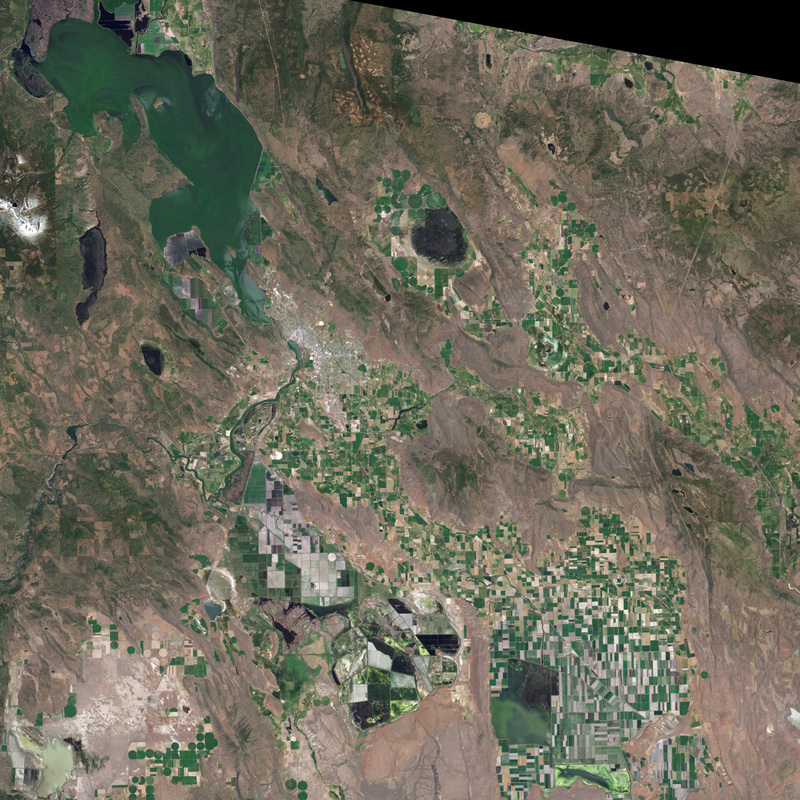 The images above show the northeast portion of the Klamath Basin in 2000 (top) and 2001 (lower). 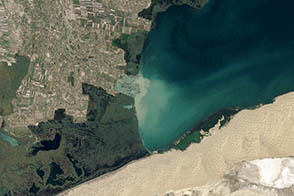 These true-color images were acquired by the Enhanced Thematic Mapper Plus sensor aboard the Landsat 7 satellite, launched by NASA and operated by the U.S. Geological Survey. Upper Klamath Lake, with its endangered sucker fish, is at the upper left, with the town of Klamath falls immediately below it. Bonanza is to the right of Klamath Falls. Tule Lake, which has been partially converted to farmland, is at the lower right and is surrounded by the Tule Lake National Wildlife Refuge. To the left of Tule Lake are the remains of Lower Klamath Lake and the marshes of the Lower Klamath National Wildlife Refuge. Farms left dry by the water shortage appear brown in the bottom (drought) image. Most of the farms without irrigation water were between Upper Klamath Lake and Tule Lake. The land immediately surrounding Tule Lake did receive irrigation water, and as a result was greener than the fields to the north. Some farms relied on wells and not Klamath Project water, and many of these remained green, as well. 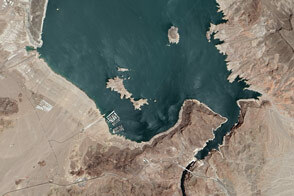 Images courtesy USGS EROS Data Center and the Landsat 7 Science Team. 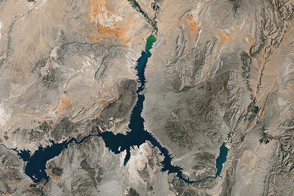 For more than 100 years, groups in the western United States have fought over water. During the 1880s, sheep ranchers and cattle ranchers argued over drinking water for their livestock on the high plains. In 1913, the city of Los Angeles began to draw water away from small agricultural communities in Owen Valley, leaving a dusty dry lake bed. In the late 1950s, construction of the Glen Canyon Dam catalyzed the American environmental movement. Today, farmers are fighting fishermen, environmentalists, and Native American tribes over the water in the Upper Klamath River Basin. 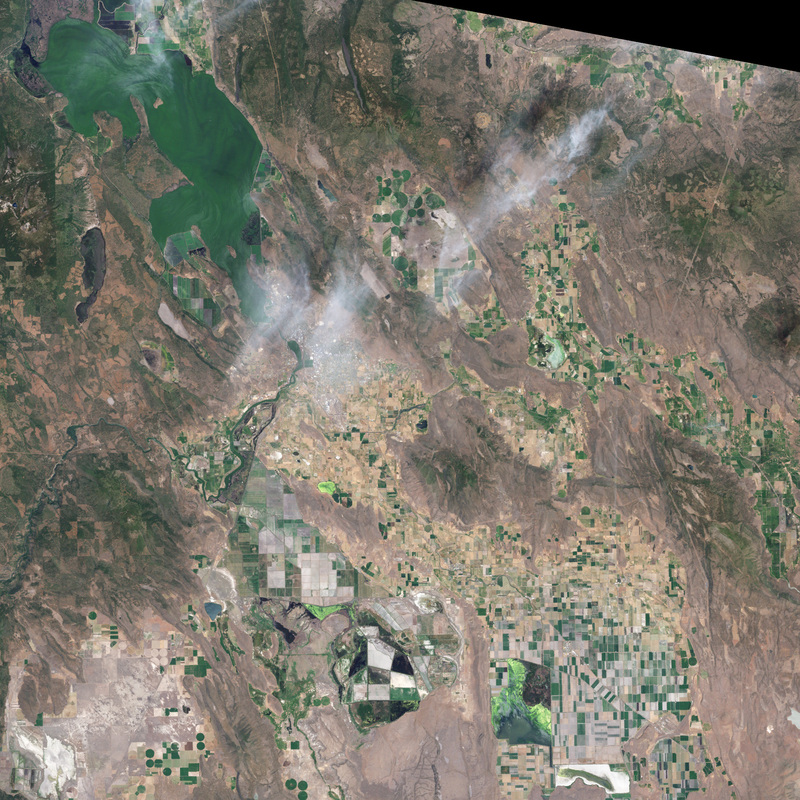 The Landsat 7 satellite, launched by NASA and operated by the U.S. Geological Survey, documented an extreme drought in the area along the California/Oregon border in the spring of 2001.